Don’t be fooled by the Bharatiya Janata Party’s recent showing in State Assembly elections. Victory comes in different shades with different meanings. Depending on its hue, it can be read differently. One way of reading the recent election results in the Indian states of Jharkhand and Jammu and Kashmir is to see them as a clear win for the Bharatiya Janata Party (BJP), a verdict in favor of Prime Minister Narendra Modi and a reassertion of his popularity. The other way of deciphering the provincial poll is to see it as emblematic of Modi’s declining appeal and the limitation of the BJP as a party. The popular narrative holds that the BJP’s recent victory in the provincial elections in Jharkhand and improved performance in Jammu and Kashmir reflect a popular endorsement of the prime minister’s politics. A closer reading of the election results shows that for the BJP, victory was a product of luck. In Jharkhand the party won 37 out of 80 seats — four short of a simple majority. Since the BJP fought the elections in alliance with a local group, the All Jharkhand Students’ Union (AJSU), it jointly secured 42 seats thereby becoming the first party in the state’s fourteen year history to gain a majority on its own. But the performance in the eastern Indian state is far below the feat that the Hindu right-wing party achieved in May’s general parliamentary elections earlier this year where it won 12 out of 14 available seats. This meant the party gained a clear victory in close to 60 Assembly constituencies. If the party had repeated its old performance it should have won at least 20 seats more than what it actually won in these recent Assembly elections. 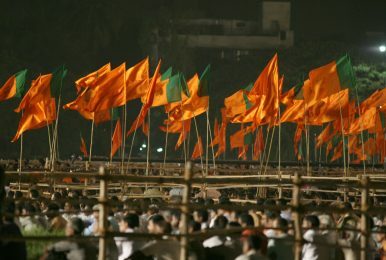 An analysis of the Jharkhand result by a Delhi-based group, the Center for the Study of Developing Societies(CSDS) says that “as in the Lok Sabha (parliamentary) elections, the BJP was successful in consolidating the Hindu vote.” This means that the party failed to diversify its vote bank and make its platform acceptable to non-majority voters. This limitation is also very much visible in Jammu and Kashmir. The BJP got a whopping 25 seats out of 87 in the bordering state — a feat never achieved in this politically and communally sensitive state. But the right-wing group secured these numbers primarily from the Hindu majority region of Jammu. It lost very badly in the Muslim-dominated Kashmir valley where it forfeited its deposits in 35 of the 36 seats it contested — a humiliating performance by a national party which went to the election with the mission of securing 44 out of 87 Assembly seats. Interestingly the Hindu right-wing party could not secure even a single seat in the Buddhist-dominated Ladakh region of the state. Compared to the BJP, the Congress party secured just 12 seats, but it managed to win these seats across all three of the religiously distinct regions of the state. In all possibility the BJP might become a part of the next government in Kashmir where it is expected to ally with the regional party People’s Democratic Party (PDP), the largest party in the State Assembly with 28 seats. If this happens, the BJP would be part of the government in Muslim-majority Jammu and Kashmir for the first time since Indian independence in 1947. Analysts say the BJP politically benefited in recent elections due to the absence of unity among opposition parties. The combined share of opposition votes in both states clearly established the fact that Modi’s party was lucky due to the opposition’s disunity and it was not uniquely the prime minister’s charisma that thrust the BJP to victory. The BJP’s recent victory still raises the question of the party’s limitations. Despite being the ruling party in Delhi, the BJP lacks the character of a national party with the support of all sections Indian society. The rightist party has a numerical majority in parliament. However, it is deficient in terms of its representation of all religious and minority communities. It remains a party of India’s Hindu majority. Recent trends and incidents — including forcible religious conversions of minority religious groups, provocative remarks against the Muslim community by a minister, a sudden spurt of attacks on religious minorities in different parts of the country, and the complete silence of the political leadership on these divisive issues — make it amply clear that the government under Narendra Modi has an agenda beyond mere economic development. It is not concerned with nurturing a pluralistic ethos in India. The very fact that the minority communities did not vote for the BJP in recent elections demonstrates a larger concern of many about the menacing rise of Hindu majoritarian politics in India. Jammu and Kashmir Comes Under Direct Rule as Ruling Coalition Falls ApartPolitical Uncertainty Prevails in Jammu and KashmirThe Problem With India’s Major Political PartiesUnderstanding India’s Political EvolutionThe Temple Guardians: Is India’ Ruling BJP Becoming More Conservative?